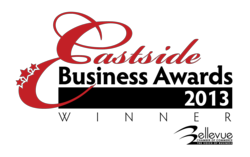 MulvannyG2 Architecture earned the Eastside Business of the Year award from the Bellevue Chamber of Commerce at its 24th annual awards luncheon on May 6th. Sixteen finalists and four overall winners were honored at the event. With the award, the Bellevue Chamber recognized MulvannyG2s sustained superior performance as an established Eastside business, encompassing the organizations business leadership in its industry, its history of recognizing and seizing market opportunities, the strength of the candidates leadership team and workforce, and the companys financial stability. MulvannyG2 currently employs more than 200 people in its Bellevue headquarters, and has created more than 50 new positions and has made more than 100 new hires since January 2012. Though given locally, the award recognizes the strength and performance of the entire firm, which includes offices in Portland, Ore.; Irvine, Calif.; Washington, D.C.; and Shanghai, China. MulvannyG2 is one of the worlds top two retail designers, and is currently ranked fourth on Architectural Records list of top design firms. The Bellevue Chamber serves as the voice of business on the Eastside. The Chamber’s mission is to foster a healthy business environment by providing strategic leadership, advocacy, tools, and resources for business success. MulvannyG2 Architecture designs retail, mixed-use, and corporate offices and interiors for clients and brands of global significance. MulvannyG2 is among the worlds 40 largest architecture firms and consistently ranks as one of the worlds top two retail designers. Founded in 1971, the firm employs a staff of 350 among five offices: Bellevue, Wash.; Portland, Ore.; Irvine, Calif.; Washington, D.C.; and Shanghai, China. Clients include Westfield, OliverMcMillan, The Irvine Company, Hines, Boeing, Starbucks, Target, Nike, REI, Kohls Department Stores, Costco Wholesale, Ivanhoe Cambridge, Shanghai Investment Group, Dalian Yida Group, China Resources, Suning Real Estate Development, and Fujian Provincial Power Company.